Microsoft has a lot of catching up to do. While there's no doubting the company's might, it seems increasingly ossified and unimaginative compared to its rivals. Last November, it posted a 22 per cent fall in profit. Although that still left a not-inconsiderable profit of $4,47bn, the question remains: can Microsoft change its strategy before it's completely eclipsed by Google? When Google launched its first own-brand mobile device, the HTC-made T-Mobile G1, there was a lot of scepticism about the search giant's ability to build a competitive smartphone. However, as Android matured, improved devices such as the Nexus One began to present a serious challenge to the iPhone at a time when Apple offered one of the few viable smartphone options. Up until recently, Google has only had limited success in selling hardware directly on the Play Store, as most of the vanilla Android-bearing Nexus phones had only really appealed to the Android army or app developers. Nexus 7 has changed that. Delivered by Asus with an astoundingly low price-tag and excellent specs, it's really caught on with those seeking a more affordable alternative to the dominating iPad. More recently, Google's LG Nexus 4 has been almost permanantly sold out - as you'd expect for a very desirable phone at half the price of the iPhone 5. Through all of these devices, there has been one constant principle: Nexus devices are fully approved by Google and sold directly as well as through network partners. By taking this route Google has shown itself equal to the only other major phone manufacturer to sell its devices directlto the consumer - Apple. So what has Microsoft been up to while Google has built a solid foothold in the smartphone market? Not as much as you'd think - tentatively allowing established partners to develop phones with their fledgling software on board, and then allowing networks and retailers to do as they like with them. When it re-imagined Windows Mobile with Windows Phone, MS had the perfect chance to launch its own phones or tablets and go for broke. But for reason it has never disclosed, Microsoft failed to take control of its own product range. Instead of putting the Microsoft name on the hardware, it looked to long-term partners HTC and Samsung to help deliver new Windows Phone-powered handsets to market. Although many were excited by the new design direction of Windows Phone 7 (which has continued with Windows Phone 8), the initial hardware selection was truly uninspired. Microsoft languished behind the competition. As far as tablets were concerned, Microsoft was still trying (and failing) to convince people that the traditional desktop experience was really usable on a smaller touch-screen. Unfortunately, most of the equipment manufacturers were doing little to help Microsoft, with silly ridiculous price-tags attached to hot, heavy disappointments. 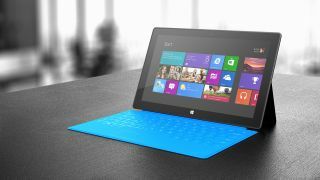 With the arrival of the Microsoft Surface RT tablet and Windows 8 however, Microsoft has taken a step in the same direction as Google and started selling the devices directly. But MS has not been able to match the success of the Nexus devices, and the Surface has had only modest sales in its first month on sale, with projections for a million units shipped in Q4 2012. Contrast this with the Nexus 7, which is said to be topping a million sales per month. While it may not be as profitable as the Surface, at this stage Google is happy to do all it can to gain market share safe in the knowledge it has a well established store and advert model. So why is Microsoft still flagging? Firstly, because MS doesn't really offer anything exclusive on its Surface Tablet that couldn't be done by other manufacturers such as Dell or HP.